Set sail for an exciting treasure quest in this game by Wager Works, with imagery that evokes the thrill of life on the seas, in search of bounty that may well fall into your lap. The graphics are complete with Pirates, Vikings, sail ships, treasure chests and boxes. The music matches the mood with the beat of a march of soldiers in the beginning and in more sober mood later on. Captain Quid’s Treasure Quest is a 4-reel 15-payline slot with a maximum jackpot of a whopping 10,000 times your line bet. The bets range from 0.01 to 5 credits per payline with a wager of 1 to 5 credits on each payline, and the maximum win can go up to 250,000 credits. 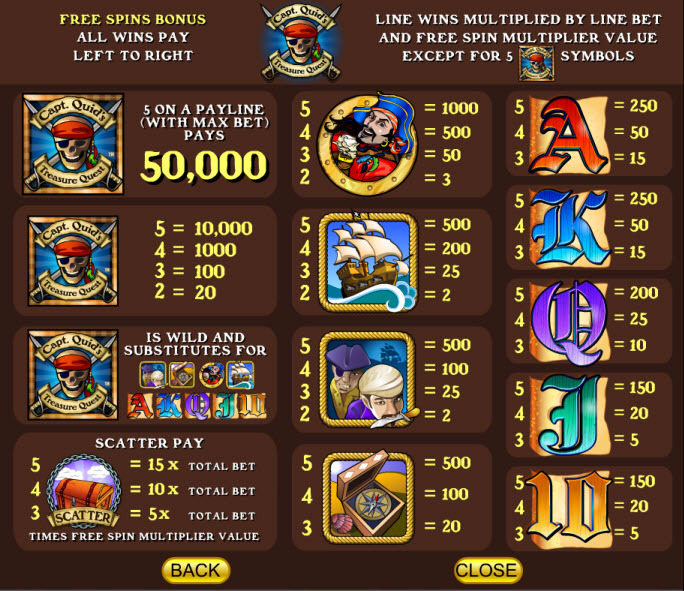 You win this jackpot if you line up 5 wild symbols of Skulls and Swords on any active payline. This wild symbol substitutes every other symbol except the scattered Treasure Chest. The Treasure Chest is the scatter as well as the bonus symbol. Three or more of these symbols anywhere on the reels trigger the Free Spins round. 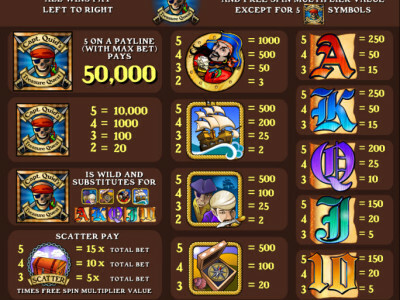 In the Free Spins round a multiplier is applied to all your wins. The game allows you a wide range of flexibility. You can choose the lines you want to bet on and, if you so desire, you can bet different amounts on different lines. And the top jackpot like the one in this game does make it worth at least a few spins.